Home News & Updates Leap Motion Laser Tanks! The goal of this project was to create a set of robotic tanks to do battle where the operators got a more realistic feel for controlling the vehicles using the Leap Motion controller. 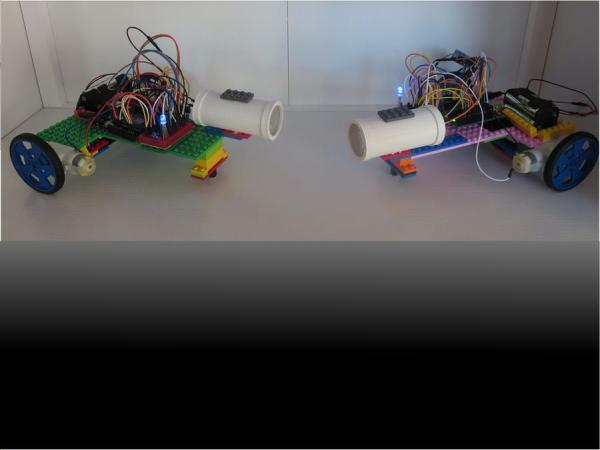 I wanted to create the robot tanks inexpensively, so people could replicate the project as easily as possible. The tank body is made out of generic Lego bricks and plates. The power source is a simple block of 4 AA rechargeable batteries. The controller for the tank is an Arduino Uno R3. “Propulsion” is two simple DC motors with wheels in the back with a single caster in the front using a single L293D integrated circuit. The “weaponry” is a single IR LED light and the “armor” is a set of IR sensors which detect hits from the opposing tanks IR LED. The “heads up display” is a single multi-colored LED telling you of any actions occurring on the tank including your armor status. Finally the “control” of the tank is handled wireless-ly via a Raspberry Pi 2 running NodeJS connected via a RF24 wireless module which each tank also is equipped with. 1) Assemble tanks and wire them using the schematics below. Download the needed Arduino libraries (see README in github repository), Compile, and Upload the arduino sketch for tank1 to one tank, and tank2 to the other tank. 2) Wire the RF24 transceiver to the Raspberry Pi. Install Raspbian OS and node JS on the Pi. 3) Download, Configure, and Build (see README in github repository) the RF24 library on the Pi. 4) Download the NodeJS server software from the github site, configure, and start up the App Server/Web server (see README in github repository). 5) Install the Leap Motion and drivers onto your computer. Open a browser and load the URL to the Raspberry Pi Rest/Web server to load the web page (see README in github repository) to control tank one or tank two. 6) Click the calibrate button and hold your hands over the leap motion so it detects two hands and knows your neutral position. Once calibration is complete you can control the tank with your hands. The body of the tanks is assembled from simple legos that were “gorilla glued” to parts (motors, breadboards, etc) of the tank to help hold it together. Here is a slide show to show how this was done. 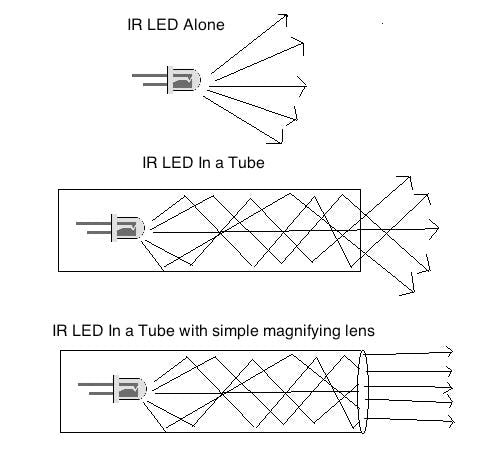 I ended up purchasing a very inexpensive pocket magnifying glass at a drug store, taking the lens out of that and building a tube around it and having the Infrared LED at the other end of the tube, and this worked perfectly for narrowing the beam of the IR LED to be more precise. For more detail: Leap Motion Laser Tanks!